A weekly newspaper’s coverage of a Banksy exhibition on its patch has been honoured at its parent company’s annual awards. 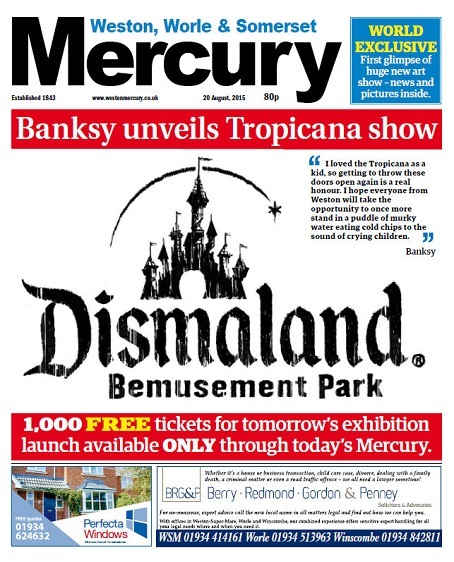 The Weston, Worle & Somerset Mercury won the Best Content of the Year prize at Archant’s annual awards for its coverage of Dismaland, an exhibition by the stretet artist. The newspaper revealed the exhibition in a ‘world exclusive’ on the above front page, and also struck a deal with organisers to give away all 1,000 tickets for the show’s opening to readers. Other winners included the Eastern Daily Press which was awarded the company’s Campaign of the Year (Editorial) title for its Surviving Winter campaign. Archant’s central graphics unit was awarded Innovation of the Year (Product or Service), while its new design team won Innovation of the Year (Process). Bright Idea of the Year went to regional magazine Cotswold Life for its Engineering, Manufacturing and Innovation awards. The company’s circulation team won Team of the Year. The awards, which were held near the company’s headquarters in Norwich, were attended by over 240 finalists and colleagues, on Thursday 21 January. In total, more than 500 entries were received from across the company. Dee Willmott, Archant chief HR and development officer, said: “The Archant Awards provide a wonderful opportunity to focus on and celebrate the extraordinary achievements and excellence of our colleagues from every function across the business.